The Raps started off with a 72-point first half. You read that right, 72 points. Raptors' fans then had free pizza at the end of the third. The Raptors put out an amazing performance against the Washington Wizards on Wednesday night, blowing out the Wiz 127-108. DeMar broke out of his slump and had 20 points and 6 rebounds in the win. It was a total team effort, as the Raps had seven players in double figures including the rook, Ed Davis. 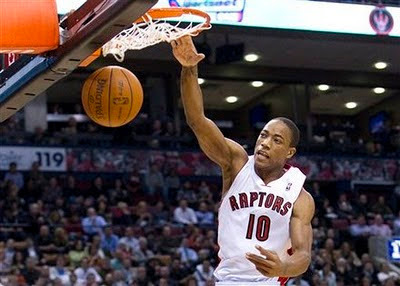 Davis made his Raptor regular season debut, after being called up from the D-League's Erie Bayhawks. He looked energized and hungry, scoring 11 points to go with his 6 boards and 2 blocks (one against John Wall) in 24 minutes of play. Toronto had an impressive shooting night, making 51-88 (48%). The Wizards defense was non-existent tonight as the Wizards looked to be gassed on their second game of a back to back. The Raptors' bench put out another great performance, led by the new Killer B's (off of the bench), Jerryd Bayless and Leandro Barbosa. The duo combined for 32 of the 56 points from the Raptors' bench. This was a revenge game for the Raptors, revenging the loss to the Wizards back on November 16th. The Wizards were missing an important member of their offense last night, Gilbert Arenas. The Hibachi was just 1 for 10 from the floor, struggling to score 7 points.. The ROY early candidate, John Wall, put on a decent performance for Raptors fans, scoring 19 points and dished out 8 assists. The big man, JaVale McGee led the Wizards with 21 points.